Slow cooker Italian chicken breasts recipe. Cubed chicken breast tenderloins with vegetables and spices cooked in a slow cooker and served over cooked pasta. Very easy and tasty Italian recipe! Chicken cooked in a slow cooker turns juicy and very delicious! Just try to prepare this recipe! Boneless and skinless chicken breasts with vegetables, mushrooms, and spices cooked in 6-quart (6 L) slow cooker. Yummy! Instructions: Lightly grease inside of your slow cooker with nonstick cooking spray, then place chicken breasts on the bottom. In a medium mixing bowl, combine remaining ingredients and mix well. Pour the tomato mixture over chicken breasts and turn well to coat. Cover the cooker and cook on low-heat setting for 7-9 hours or high heat for 3½-4½ or until chicken is cooked through. Turn off the slow cooker and open the lid. Stir well before serving. Transfer cooked chicken and vegetables to serving plates. 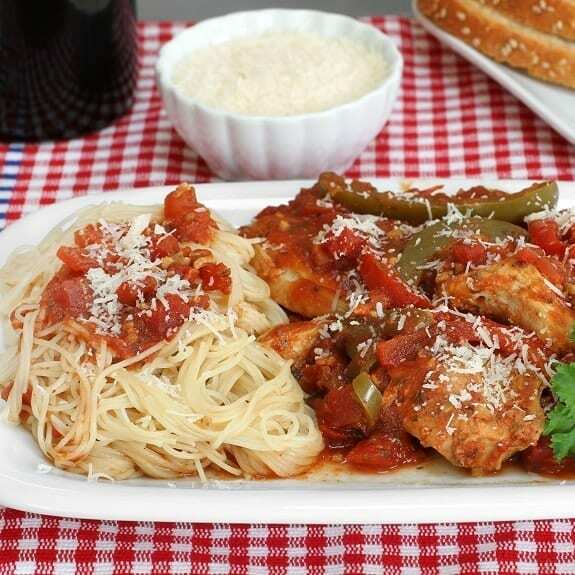 Serve Chicken Italiano over cooked pasta or rice. Grease inside of your slow cooker with nonstick cooking spray. Place green beans, quartered mushrooms, and sliced yellow onion in the slow cooker. Top with cubed chicken. In a medium mixing bowl, combine undrained tomatoes, tomato paste, Italian seasoning, and garlic powder. Mix well and pour tomato mixture over chicken. Cover slow cooker and cook on low-heat setting for 5-6 hours. Turn off the slow cooker and open the lid. Stir chicken-tomato mixture well before serving. Serve over cooked fettuccine, spaghetti, or linguine. Top with grated Parmesan cheese, if desired.